The Finotec brokerage company was established in 1998. It provides financial services in the forex market. To open a standard account the broker’s clients need $10,000. However, not all traders have such a sum. Thus, Finotec offers mini accounts which require to have only $200 on a deposit. Besides, there are demo accounts. The broker’s clients can benefit from such trading instruments as CFDs, stocks, options, oil, and precious metals. 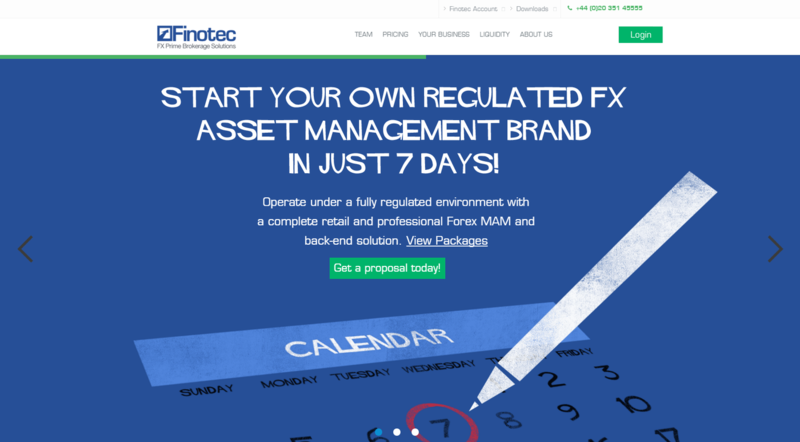 Trading can be performed via Finotec Trading Platform. Beginning traders can enroll in online courses provided by Finotec and E-marketonline, the main forex education center. Moreover, Finotec offers bonuses for traders, who invite their friends. I am a client of Finotec with a individual account and a deposit currently of 1200$. My first deposit was 300$. I usually withdraw my profit and I keep some money in the trading account. This helps me to trade bigger volumes if there are opportunities. I trade CFD's and currency pairs. My profit is between 1000-1400$ mothly, and I am really pleased with that. The platform works easy and accurate, the broker is honest and doesn't have hidden fees during withdraw process. From my point, Finotec is a reliable broker, and you can try this broker. I joined this broker in last year when my friend recommended this broker to me. At the beginning, I opened demo account to test the platform, and after that I opened real account which I have traded until now. Their platform has been great and fast. At the moment, I have opened 15 positions using USD/JPY, EUR/USD, EUR/JPY, and I have won all. Thus, this result is great for me when I compared to other brokers that I have used their platform in which I have not been able to make profits! Moreover, Finotec offers conditions that suit needs of both the newbie and advanced traders. I have made many withdrawals, although most of the loses I incurred during my trading were due to my trading mistake. Indeed, I am fine doing my trading with Finotec, and I recommend this broker to all traders who want to make money. Finotec provide very good trading conditions, reliable customer support and narrow spreads. My trading strategy does not require high leverage, so their system works perfectly fine for me. I make lots of profits and I'm able to withdraw the funds almost instantly. This morning I closed on a long NZD/USD on the short term with almost $1000 profit. Now the money is available on my credit card. I had a really hard time with this broker.System twerks slow, positions doesn't close when you ask, which was why I decided to close the account account and withdraw my balance in the account. So much stress, ever since I placed the withdrawal request, I can not withdraw my money since a month ago now and I am still counting They do not respond to e-mails. Finotec just look nice, in which they are the opposite,don't waste your time and money. Finotec provides good services and before you make real trading, you can apply for a demo account. It’s very easy to open an account because it doesn’t take too much time to fill in applications and forms. Their trading platform is easy to use, it doesn’t have any issue, very suitable for beginners. Spread is reasonable and I can get access to my account at any PC, even in my mobile and that is great for me as I travel a lot. Support department works perfectly, solve my doubts very fast. That’s why I recommend this broker a lot. Bad Broker for me, every day has connection problems which I don't have with my other MT4 brokers. When you want to close or open a position "cannot connect to server", while price is moving so there must be a connection. When I close a long order which is going up it close immediately, when price moves down it takes a long time. I have closed my account with them. Yehey! Just got my profits today! I am very thankful that this broker allows me to withdraw my earnings worth $180. I thought it was not allowed to withdraw more than $100. :) Because of this, I will start to deposit my own funds and open another trading account. Anyway, the profits that I currently received are made over the bonus that I got from referrals. I tried this broker a few years ago. I trade their institutional platform and didn't have any issues, the platform is very different from MT4 and is suitable for beginners. Spread is reasonable and I could login from any computer, that was interesting because I was travel very often. Also with the help of there dealing desk guy, I have made some great deals. The Finotec brokerage company's spreads on live are nothing like those on a classic or micro account. For this reason it is not always possible to have a good practice on a demo. But still other broker is a good and relaxed. Hello, i want to tell you my bad experience with this broker. They have very very bad customer service. they don´t solve customers problems and don´t answer to your questions.